First off, I should apologize for my lack of posts. There is no excuse really, but I was busy preparing for Greg's graduation party and his family's visit. Also, I was working my last two weeks of work at one of the worst jobs I've ever had, as the personal asst. to an enormously rich excessively mean woman. 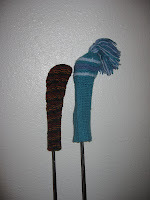 Now, I have a few days off between jobs and was able to put the finishing touches on my golf club covers. This summer I am hoping to learn to play, what many people have warned me can become a compulsive addiction, golf. Greg's mother gave me an exceptionally nice set of used golf clubs last fall and I am ready to give it a go. What I like about golf is what I like about bowling - the goal is beating yourself, more so than your opponent. However, unlike bowling you can do it outside. I've been preparing for my golf lessons, which start next week, by renting DVDs like Golfing for Dummies and knitting and crocheting snazzy golf club covers. I mean it is always important to be properly accessorized. As I was making these golf club covers I realized they would be a perfect Father's Day gift for the Dad that likes to hit the links. They knit or crochet up super quick and are perfect for using up that acrylic yarn that you bought because you loved the color but never found a use for. I searched the internet and various blogs extensively to fine one easy knit and one easy crochet pattern. 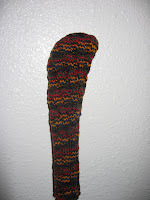 The rainbow golf club pictured was knit in the round on four needles using the Spiral golf club pattern at Sarah Peasley's Hand Knitter website. 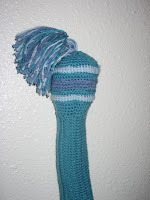 The blue golf club cover pictured was crocheted. The pattern is from the May/June 2008 issue of Crochet Today. This issue is on new stands now. I bought my copy at Michael's. I think you can also buy it at Amazon.com This picture is of the X-Large golf club cover pattern and was even quicker to work up than the knitted version. I made both of these as sort of prototypes and plan to make myself a matching set so that I can look completely styling on the golf course. Of course, I hope I can pick up golfing as easy as it was to make these accessories. If you decide to make a golf club cover for Father's Day send Gretchen or me a picture of your work and we'll post them. Those look great! And what a great gift idea for those hard to shop for dads!